In 2015, religion journalist David Van Biema was invited to Manhattan’s Les Enluminures gallery to view a book from the Liesborn abbey in Germany. The $6.5 million ceremonial book, with an oak cover and vellum pages, contained the four Gospels. It was rare, but even more intriguing was a drawing made on the blank first page. It looked like something from J.R.R. Tolkien’s Middle Earth, yet it was recognizably Christian: a circular diagram of concentric bands, labeled in Latin. It was a Da Vinci Code experience that raised many questions -- How was the diagram used 900 years ago? And how could it be used today? Riess, an author, speaker, editor and columnist for Religion News Service, spoke with Faith & Leadership about the book and how contemporary Christians can employ this lost practice. The following is an edited transcript. Q: What do we know about the prayer wheel? It’s pretty unusual that you would rediscover a spiritual practice. The diagram is about 900 years old; the book of Gospels is older than the diagram inside it. From what we’ve been able to determine, [the prayer wheel practice] was limited to monasteries and convents. Someone might have used one of these diagrams in training people who were not literate, but we don’t have any record of that. What we do know is that there were hundreds of these wheels at one time. We can also trace the fact that they become more complicated as time goes on. I find that part of the story very interesting. 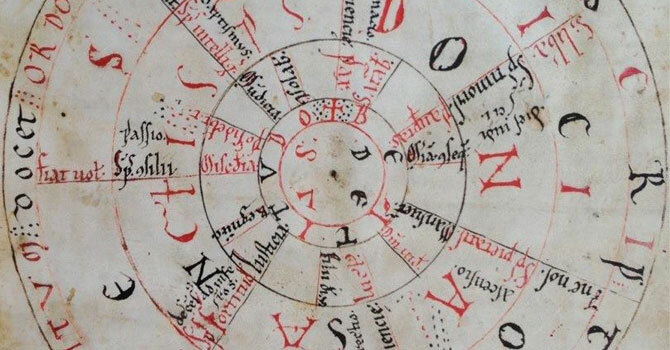 Our wheel is the second-oldest that we’ve been able to track down; ours dates from about 1100.